It was our agent on the phone. The year before we’d tried to sell this rental property at her urging but we didn’t even get an offer. We decided to rent it out again and wait until spring. She suggested a list of things to improve before we relisted. She even had her contractor out to give us quotes on interior and exterior renovations she thought we should do to make it more appealing. So we had everything ready to go for March when she called with a new plan. She had decided the work was a waste now… and wanted to put it back on the market immediately. The market was picking up and she had clients looking for a property like ours. I like this agent. She’s really hard working and very responsive. She will go over and above to serve her client. The problem was that I no longer trusted her opinion on what to do. I wasn’t sure she had our best interest at heart. I was sure she wanted a sale. There’s more to this story than this. And I know market conditions change. But, trust is difficult to gain and easy to lose. She had lost mine. We have a long-term relationship with her so we’re still going to list with her, but we’re doing it our way. If we didn’t already have a relationship with her, however, she would have lost our business. The challenge as a real estate agent is that your clients know that you only make money when a property sells. You may truly want what is best for your client but you also have kids to feed and your own bills to pay, right? That creates an interesting dynamic for you, and for your clients. 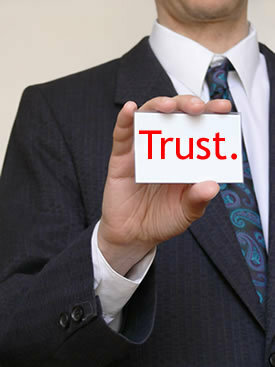 As a result, you may earn trust and then erode it with little missteps. Click through for the five things you might be doing that could be eroding trust and costing you deals.